University of Delaware researchers have been awarded a $475,000 grant from the United States Department of Agriculture (USDA) to study how large tropical storms impact stream water quality and aquatic ecosystems, specifically the amount and fate of sediment-associated carbon and nitrogen that is eroded and deposited in streams following such intense weather events. Shreeram Inamdar, professor in the Department of Plant and Soil Sciences (PLSC) in UD’s College of Agriculture and Natural Resources and director of the water science and policy graduate program, and Rodrigo Vargas, assistant professor of plant and soil sciences, will lead the project for UD. They will be joined on the project by Jinjun Kan, a microbial ecologist from the Stroud Water Research Center (SWRC) in Avondale, Pennsylvania. Previous work and publications by Inamdar’s research group have shown that large tropical storms like Irene and Lee in 2011 and Sandy in 2012 have substantial energy to erode large amounts of sediment and particulate material and transport them into and through waterways. 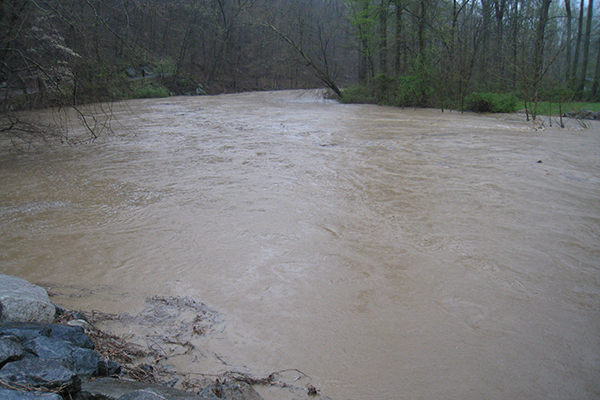 Working in a small, forested headwater watershed in Maryland, UD alumnus Gurbir Dhillon – who worked with Inamdar and received a master’s degree in plant and soil sciences in 2012 – found that in just 59 hours, stream runoff from tropical storm Irene produced nearly half the annual export of organic carbon from the watershed in 2011. The enormity of this organic carbon input to the stream is similar to a human being consuming all of the day’s meals in just 18 minutes, Inamdar said. Such large sediment and nutrient pulses, which are also occasionally referred to as “hot moments,” can have significant water quality implications for downstream water bodies such as the Chesapeake Bay, he said. Inamdar said understanding how these large storms impact water quality and aquatic ecosystems is important because research suggests that there already has been an increase in the intensity of large – top one percent storms – over the past 50 years and future climate change projections indicate further intensification of the largest storms, especially for the Northeast and Mid-Atlantic. Inamdar said that capturing data during these large and intense storms can be very challenging, especially when flooding is involved, but the scientific insights that are generated can be very rewarding. “I guess that studying and monitoring tropical storms and hurricanes is similar to the thrill and excitement that tornado chasers experience when they chase tornadoes out in the Midwest,” he said. While the scientific focus has typically been on dissolved forms of nitrogen and phosphorus, particulate forms of nitrogen and phosphorus that are eroded during these storms can also stimulate algae growth and thus degrade water quality, Inamdar said. Even at the large scale of the Chesapeake Bay, he said, sediment exports from tropical storm Lee in September 2011 were so large that they were clearly visible in satellite photosreleased by National Oceanic and Atmospheric Administration (NOAA). These sediment/particulate inputs not only pose an immediate water quality threat but could also have long-term consequences for the Chesapeake and similar coastal water bodies, Inamdar said. 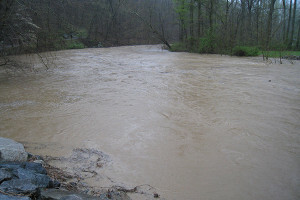 As an example, he noted that sediment and nutrient inputs associated with the highest-ever recorded flows on the Susquehanna River following tropical storm Agnes in 1972 impacted Chesapeake Bay habitat and fisheries for decades. Inamdar, Vargas, Kan and their students will study how and where sediment and particulate organic carbon and nitrogen is deposited in the stream drainage network, identify the “hot spots” and sources of erosion and deposition, what proportion of the particulate carbon and nitrogen is leached/released into the overlying stream waters and is bioavailable, and what type of microbes participate in degrading the particulate material. The researchers also will study the release of carbon dioxide, a greenhouse gas, from decomposing carbon in the sediments and its significance for regional and global carbon cycles. Working alongside the professors will be water science and policy graduate students Richard Rowland, Erin Johnson and Chelsea Kreig. This article can also be viewed on UDaily.